Wow! This book was fantastic! I read the entire thing within hours of receiving it. I really enjoyed the story in this novel, the idea of these people coming home to a deserted planet. How scary would that be? 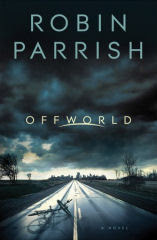 I highly suggest you goread the first chapter of Offworld, by clicking HERE. Then run to the store. Buy this book. Now. You won't be disappointed!